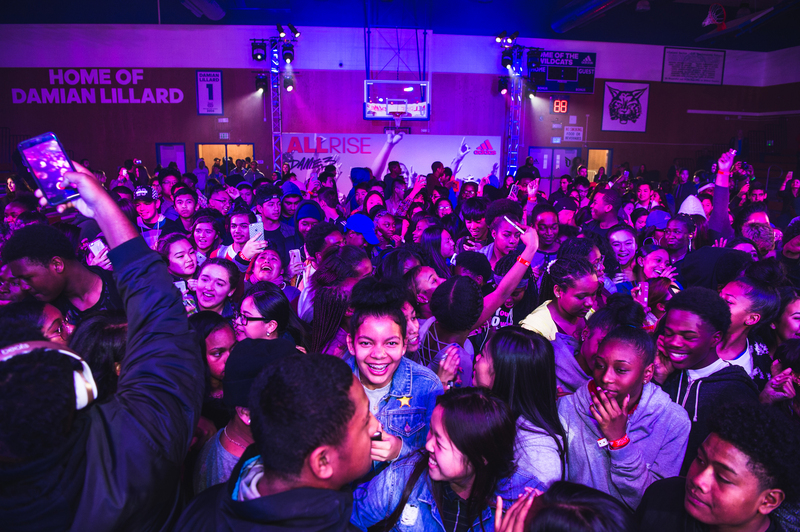 After hosting a rap concert with a “HOME OF DAMIAN LILLARD” sign in the background at his Oakland High School gym, the Portland Trail Blazers star took a moment to reflect while inspired students listened intently. “It was crazy because it took me back,” Lillard told The Undefeated after the event Friday. “I was thinking, ‘What if I was a student right now and someone from before me was up here doing this?’ I would be so amazed by it. If I was a high school student, I would say, ‘He did that from here. I’m next and I’m going to do the same thing. Whatever it is that I do, I’m going to be successful like that.’ That’s what I would have been thinking. The two-time NBA All-Star arrived back at his high school in Oakland, California, at a time when a morale boost was sorely needed. Lillard and Adidas donated money to help refurbish Oakland High’s gym, add a new scoreboard and build a desperately needed weight room that led to the disposal of aged steel weights. 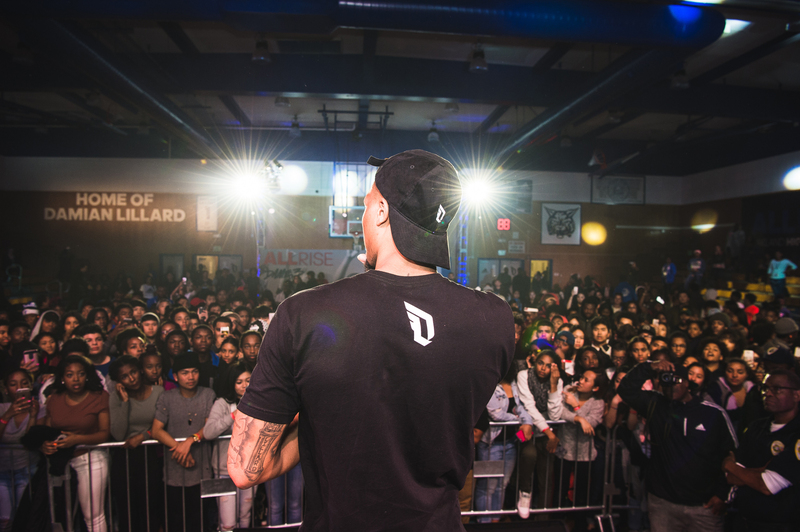 Lillard, who is also known by his rap name “Dame Dolla” and recently released an album called The Letter O, spearheaded the transformation of the closet of a music room he once used to a greatly enlarged space with new computers, a drum set, turntables, production equipment and soundproof recording studio. 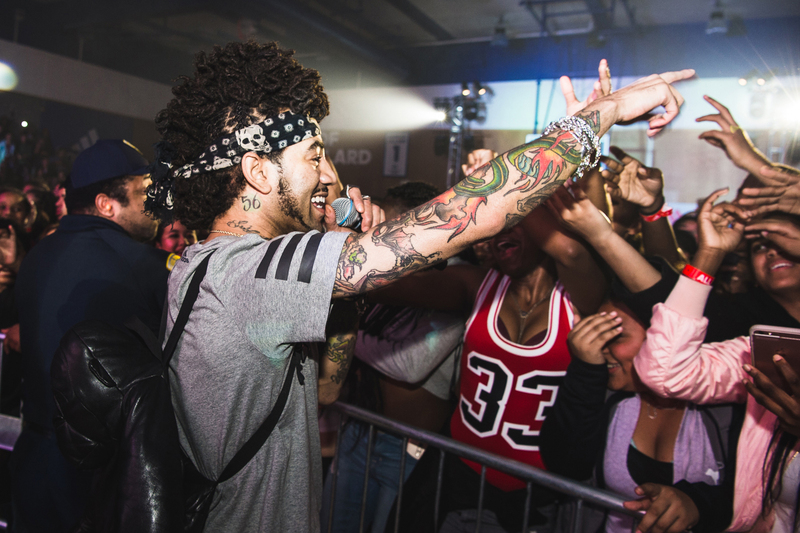 Rap stars Fetty Wap, DJ Esco and Lil Uzi Vert also performed on a makeshift stage before Lillard’s arrival for the students, who knew all the latest dances and hip-hop slang. The students received admittance for good behavior and class attendance. Lillard’s event came about two months after Oakland High senior football player Antwaun Williams was fatally shot in a bowling alley parking lot in the suburb of Alameda, California. Williams was reportedly an innocent bystander trapped in a fight between two men. “He was funny, friendly and full of life,” Oakland High assistant principal Shoshanna Towers told Patch.com. Lillard was unfamiliar with the death of Williams and became surprised and solemn once he heard the news. He recalled some of the challenges attending the very diverse Oakland public high school and playing basketball against local schools with tough backgrounds. Lillard also recalled a shooting that took place during his game at a rival high school. “It was wild here. There was a shooting at a game when I was in high school when we played at McAteer,” he said. “When we played at Mack, the seats were right on the court and they were always saying a lot of stuff in the crowd. I remembered after [that shooting] happened they had metal detectors at games and your mom couldn’t bring her purse in. Oakland High had a gift for Lillard, too, as the school retired his old jersey. Lillard was a 5-foot-11 guard with no scholarship offers from major schools when he graduated from Oakland High in 2008. The East Oakland native ended up growing four inches after graduation, starring at midmajor Weber State University and was selected with the sixth overall pick in 2012 NBA draft by the Blazers. The 2013 NBA Rookie of the Year has blossomed into the face of the Portland’s franchise and an NBA star. Oakland High wouldn’t retire Lillard’s No. 1 jersey until he graduated from Weber State. But he became eligible after he earned a professional sales degree from the College of Applied Science and Technology in May 2015. “That was a thing that was important to the basketball program here,” Lillard said. “We don’t do anything until after your education is taken care of. It was good for all the students to see how important that part is. Education is the key to getting where a lot of them need to get to. For me, I can’t play basketball for the rest of my life. Lillard told Oakland High students that he believed in them and that “anything is possible.” Considering the school’s heralded alumni list — which includes singers Sheila E. and Dawn Robinson, rapper and radio personality Sway Calloway, actor David Carradine, novelist, journalist and civil activist Jack London, former Major League manager and All-Star Bill Rigney and several notable politicians, civil dignitaries and athletes — there’s certainly reason to believe anything is possible from this school. And if the Oakland High students need even more motivation, all they have to do is learn Lillard’s bootstraps road to the NBA. He never gave up on what appeared to be lofty NBA dreams despite being told at the second of the three high schools he attended that he should pursue something else. “I was at St. [Joseph’s Notre Dame High School] my sophomore year and at the end of the first marking period I was ineligible for a little bit. I was just having a hard time,” Lillard said. “I didn’t want to be here. I was lazy in the classroom and was halfhearted with it. I was on the team, but wasn’t getting in the games. I was in a bad spot. I stuck with it for the most part. “When the season ended, the basketball coach there, Don Lippe, he basically told me, ‘I don’t know if you’re going to be on this team.’ He broke down all these numbers saying, ‘This many high school basketball players go to college, this many get a scholarship, this many play pro, this many make it to the NBA … ’ It got down to this really small number and he was like, ‘This is how hard it is.’ I told him, ‘I know,’ and he smirked at me and chuckled.